Happy Kuji: Hatsune Miku 2013 Summer version Campaign Starts! 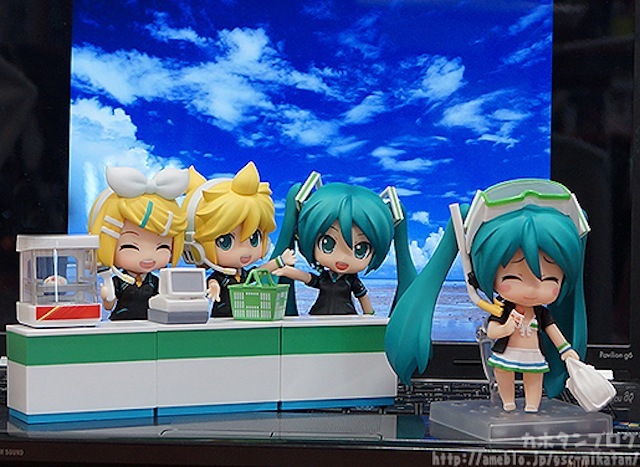 The FamilyMart 2013 version of Nendoroid Hatsune Miku, Nendoroid Kagamine Rin, and Nendoroid Kagamine Len have been announced weeks ago, and today, the lottery campaign finally starts! Win various character goods through the Happy Kuji! A lottery where every draw wins a prize! There are all sorts of products to get your hands on from special generous items to smaller goodies to have some fun with! You can take part at your local FamilyMart! So … what is a “LAST PRIZE“? This prize is given to whoever draws the last lot out of the box, together with whatever they draw! The cute white, blue and green swimsuit suits Miku so well! Plus the black skirt over it adds lovely contrast! Anyway, if you want to take a closer look at the prizes, kindly visit Kahotan’s blog. This entry was posted in News and tagged family mart, famima, happy kuji, kuji, lottery, nendoroid. Im going to japana on like 28 september will it be possible for the kuji prize to still be there? also is it at every family mart? I think the campaign will still be running by then, but the prize stock might have run out. As far as I know the campaign is available on most Family Marts, but not necessarily all of them.